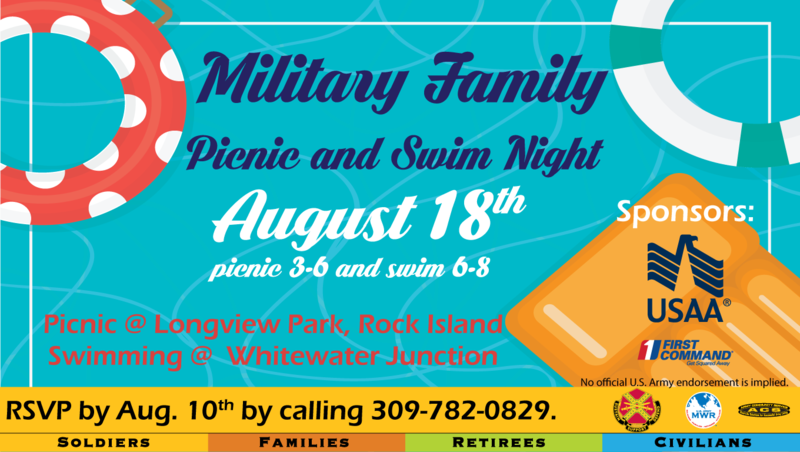 Date: Aug 18 2018, 3 p.m. - 8 p.m.
All Military Families are invited to join MWR at Longview Park and Whitewater Junction Water Park for a fun night of family and team building. The event starts with a catered picnic at Longview where there will be plenty to do including various yard games and activities followed by free entry to Whitewater Junction Water Park. All this fun and food is made possible by generous support from our Sponsors, USAA and First Command Financial so make sure to stop by and say hi if you see them at the picnic. No official U.S. Army endorsement of Sponsors is implied. Please RSVP by August 10th by calling 309-782-0829.